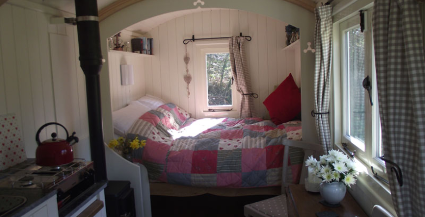 Beautiful Shepherd's Hut set in it's own, private riverside field. Self contained with eco loo and shower, wood-burner and fully equipped kitchen area. Bedding and towels provided, also basic provisions for breakfast. The perfect location for a romantic break or escape from the world. Ideally situated to explore the southern and western Lake District, tucked away from the madding crowds.